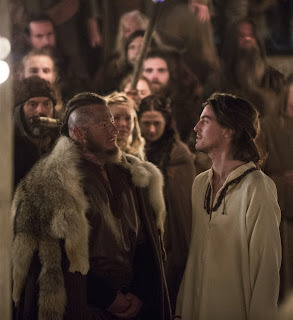 New York, NY – January 12, 2017 – Toronto Blue Jay third baseman Josh Donaldson, the 2015 American League MVP, will make his acting debut on next week's episode of HISTORY's hit drama series “Vikings” on Wednesday, January 18 at 9 p.m. ET/PT guest starring as Hoskuld, a Viking warrior of great skill. About “Vikings”“Vikings” is the critically acclaimed series from creator and sole writer Michael Hirst (Academy Award® winning film Elizabeth and the Emmy® and Golden Globe® nominated series “The Tudors”) and is a family saga that tells the remarkable tales of the lives and epic adventures of the raiders and explorers of the Dark Ages. There are three more episodes remaining in season four, with the season finale airing February 1 at 9 PM ET/PT on HISTORY. Season five of “Vikings” is currently in production in Ireland as Golden Globe®Award winner Jonathan Rhys Myers (The Tudors) joins the cast. HISTORY®, now reaching more than 96 million homes, is the leading destination for award-winning series and specials that connect viewers with history in an informative, immersive and entertaining manner across all platforms. The network’s all-original programming slate features a roster of signature series including “Pawn Stars,” “American Pickers,” “Swamp People,” “Alone” as well as the hit drama series “Vikings.” The HISTORY website is located at history.com. Follow us on Twitter at twitter.com/history and Facebook at facebook.com/history.